How did Jews go from lives organized by synagogues, shul, and mikvehs to lives that—if explicitly Jewish at all—were conducted in Hillel houses, JCCs, Katz's, and even Chabad? In pre-emancipation Europe, most Jews followed Jewish law most of the time, but by the turn of the twentieth century, a new secular Jewish identity had begun to take shape. Homes Away From Home tells the story of Ashkenazi Jews as they made their way in European society in the late nineteenth and twentieth centuries, focusing on the Jewish communities of Paris, Berlin, and St. Petersburg. At a time of growing political enfranchisement for Jews within European nations, membership in the official Jewish community became increasingly optional, and Jews in turn created spaces and programs to meet new social needs. The contexts of Jewish life expanded beyond the confines of "traditional" Jewish spaces into sites of consumption and leisure, sometimes to the consternation of Jewish authorities. 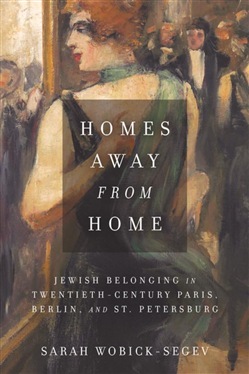 Sarah Wobick-Segev argues that the social practices that developed between 1890 and the 1930s—such as celebrating holydays at hotels and restaurants, or sending children to summer camp—fundamentally reshaped Jewish community, redefining and extending the boundaries of where Jewishness happened. Acquista Homes Away from Home in Epub: dopo aver letto l’ebook Homes Away from Home di Sarah Wobick-Segev ti invitiamo a lasciarci una Recensione qui sotto: sarà utile agli utenti che non abbiano ancora letto questo libro e che vogliano avere delle opinioni altrui. L’opinione su di un libro è molto soggettiva e per questo leggere eventuali recensioni negative non ci dovrà frenare dall’acquisto, anzi dovrà spingerci ad acquistare il libro in fretta per poter dire la nostra ed eventualmente smentire quanto commentato da altri, contribuendo ad arricchire più possibile i commenti e dare sempre più spunti di confronto al pubblico online.